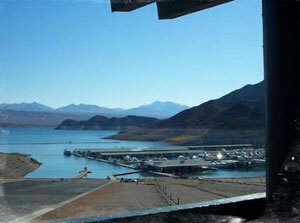 Do you need high speed wireless internet for a convention or other event in Echo Bay, Nevada? LV.Net provides top quality high speed wireless microwave internet to Echo Bay. We are able to provide a high speed connection or Wifi for hotels, motels, RV Parks, offices, and other buildings and areas. Providing wireless high speed access for vacant plots of land, campgrounds, and remote areas is also not a problem. LV.Net uses wireless microwave broadcast to provide internet access. Our microwave network transmits signals between radio relays. The broadcast follows a line of sight path. Transmissions travel at close to the speed of light, and the network can provide internet speeds of up to 1 Gbps. Lengths between relays run for miles. Installing a connection involves configuring radio relays. Because there is no fiber optic cable to install or maintain over the distances covered by radio transmission, high speed connections can be installed in very remote areas. Installing a high speed wireless connection is often more convenient than installing a wired cable connection as well. In many situations, LV.Net can install a high speed wireless connection in one day. Microwave internet is a very good alternative to using fiber optic cable for high speed internet access. It can be used when fiber cable access is not readily available. LV.Net is able to provide full scale high speed wireless internet to Echo Bay, including supplying any need for fully secure private point to point business networks, colocation services, and/or cloud computing. Our data centers have physical security to provide on-site protection at the location of the server. Colocation services and cloud computing can sometimes reduce costs for IT staff services and equipment/hardware, depending on the circumstances. LV.Net has been in business for over 16 years and has grown substantially since it first began providing internet service. The size of our staff has also increased with our company’s growth. Our technicians are available at any time of day, every day of the year to address any developments or network performance concerns. They will ensure that your high speed wireless internet connection stays up and running no matter the climate or weather challenges involved. They are well trained and experienced. Our wireless microwave network is designed for 99.999% uptime. Equipment is standardized where possible and can prospectively be replaced with duplicate equipment when determined by staff to be necessary. Reporting of errors is used on equipment that permits pro-active management and maintenance. Transit links to towers utilize OSPF protocol and mesh topology for fail over. LV.Net’s wireless microwave network is designed with unmatched flexibility and redundancy for maximum high speed internet performance. The high speed connection is guaranteed to continue running no matter the circumstances. LV.Net has the resources and capabilities needed to service any location in Nevada with quality high speed wireless microwave internet. If you need high speed internet in Echo Bay please contact us at 702.900.0000 today. We look forward to speaking with you. Have a convention or in need of temporary High Speed Internet 1Mbps to 1000Mbps in Echo Bay call us now 702.900.0000 for a quote or email us.